Installation of the fence shall be performed according to the construction norms and requirements. Otherwise it some time after installation it may start positivetest. And although this fact is very unpleasant, it is quite fixable. Most consolidation require fences built with metal poles. Stone, in contrast, have greater inertia, and therefore, even when a strong enough install they are able to stand long enough. - the tight connection between the stem and the soil due to excess loads. Often people in order to save time and money's not bury the poles for the fence or ignore the need for the installation of concrete pillows. All this leads to a swaying fence. Proper installation of the fence avoids a lot of problems in the future. To strengthen the fence is not necessary, if you use an additional rigid connection between adjacent columns. For this you may use the crossmember and diagonal. They can be made of steel strip. Their use allows even load distribution between the pillars. Moreover, additional hard links can be used for attaching trim panel fence, which may be a corrugated sheet or mesh netting. Normal depth fixing fence posts should be no higher than the level of soil freezing. 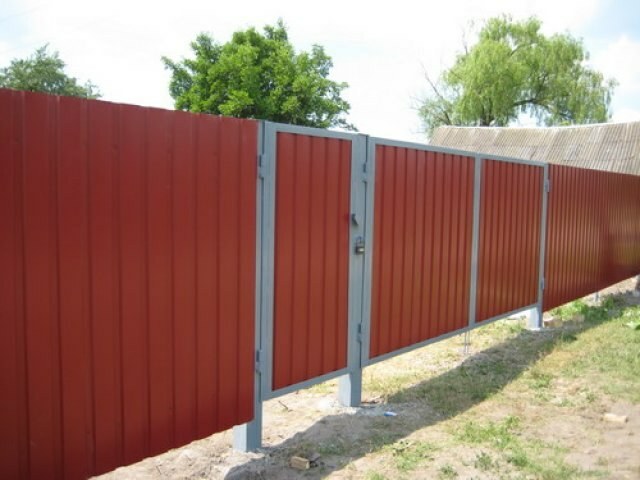 Therefore, before proceeding to strengthen the fence, you need to check it out. If the depth meets the standards, but the fence still wobbles, it is possible to perform the concrete gravy. This is partly dug into the post in the hole pour the concrete, which after drying will provide a uniform redistribution of loads on the ground. And this, in turn, will significantly improve grip fence post from the ground. If you don't want to mess with concrete work, you can next to each post to drive additional piles. You can use a steel rod, angle or construction rebar. These elements are driven from the back side of the fence. In the end, by welding secure the tip hammered a rod, or a steel angle to the pole fence. The pole must be above the ground not less than 300 mm. If you know in advance that the fence will not be able to avoid large loads, while its mounting will strengthen the pillars of the struts. In this case, they will be l–shaped.